San Jose/South Bay California is Organizing! Join us! The San Jose/South Bay Area has a new meetup.com group and a healthy bunch of activists waiting for you! This covers areas including, San Jose, Palo Alto, Santa Clara, Campbell, Cupertino, Mountainview, Los Gatos, and all surrounding cities for anyone interested. We are currently taking action on the 11th of every month and other dates as well. Some of you may recognize us from http://www.truthaction.org and http://www.theblackpacket.com. 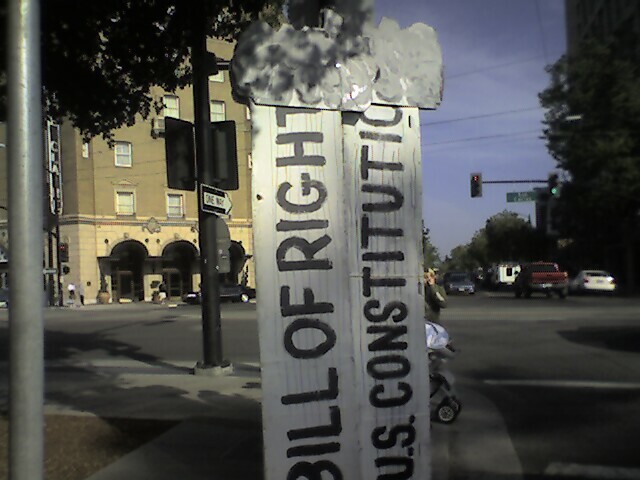 We are actively working to unite other activist groups in this area including Impeachment, Anti-War, and Peace groups. You can join our meetup group and find out more of our current events at http://9-11.meetup.com/315 . We have a great group of people and many of them have not joined the online meetup group yet so stay tuned for a lot of growth! Our first meetup occurred on May 11th 2007 and we had a great turnout! Pictures of that event are attached to this blog. 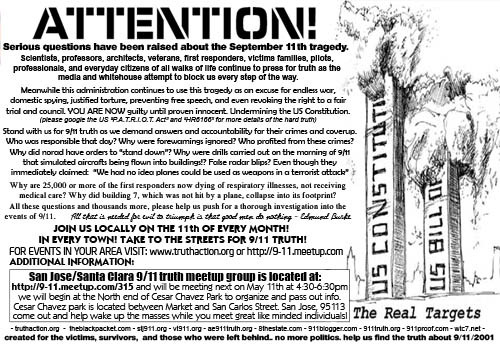 We hope that all who are reading this in the San Jose/South Bay area will join the group or contact us to get involved! All of us are highly motivated and VERY friendly! So don't be shy! Give us your ideas and we will help bring them to life! We are working on screening films in the San Jose area currently, future protests, helping spread information about events in the area, and much more! We will see you on the streets June 11th! At Bob Bowmans appearance in Campbell on June 12th! And will be joining the superheroes in Palo Alto on June 13th! "Freedom: Use It Or Lose It!" 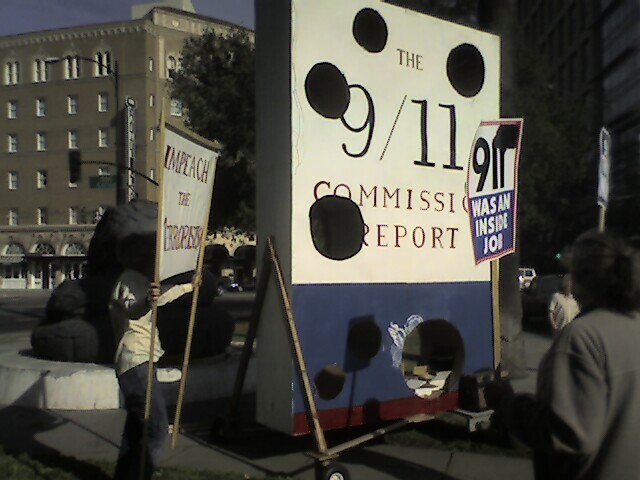 and special thanks goes out to Gabriel Day of www.911truth.org, Carol Brouillet of www.communitycurrency.org, and John Wright "Leftwright" for reminding me to post on 911blogger.com! I have always loved this site and its about time I start contributing to it! We look forward to joining forces with all of your groups in the bay area! you had better remember us flyover states, assholes! fashion is fleeting, truth is beating...at the door. wolfowitz in sh... on Mon, 05/28/2007 - 1:10am. chucksheen on Mon, 05/28/2007 - 1:12pm.